The historic burial ground at 4125 Chestnut St. that lies beneath a site proposed for an apartment building has been identified by archaeologists as West Philly’s oldest African American graveyard. 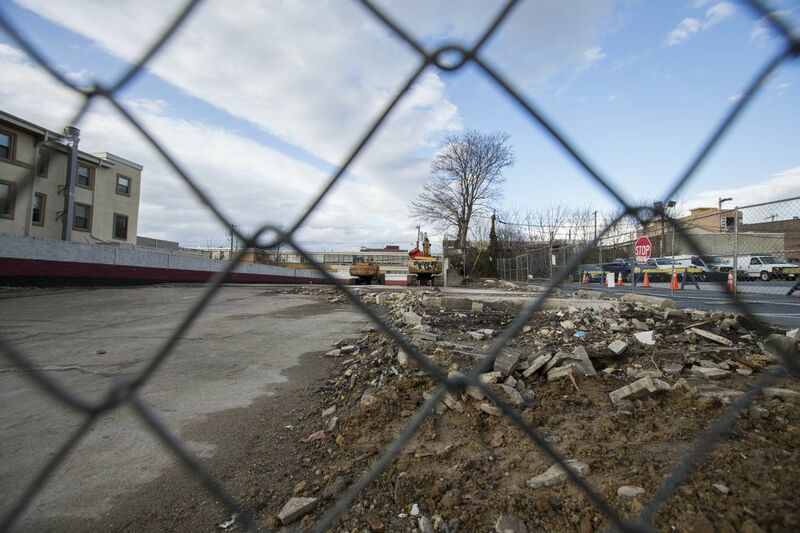 What is believed to be the oldest African American burial ground in West Philadelphia lies beneath construction machinery poised to excavate a foundation for an apartment complex at 4125 Chestnut St., according to archaeologists researching the site. The graveyard, which has associations with what is now Monumental Baptist Church, was first acquired in 1826 as open land and was used regularly for most of the rest of the 19th century as a resting place for African Americans, the archaeologists said. It is unknown how many people were buried on the site, which until this week was home to Chestnut Wash 'n' Lube. According to some historic maps of the area, the graveyard extends east beneath the former car wash and under land now owned by the University of Pennsylvania. Archaeologists are concerned about the possibility that excavation will begin to disturb and expose human remains in much the way construction disturbed hundreds of grave sites in the 200 block of Arch Street last year. "We know that four historic maps between 1872 and 1901 identify this as a graveyard," said Douglas Mooney, president of the Philadelphia Archaeological Forum, which raised concerns about the construction in a letter last week to the Department of Licenses and Inspections. "A [newspaper] article in 1885 states unequivocally that there are burials. There's no question. This is an African American cemetery." Graveyard at 4125 Chestnut St. is marked on the 1895 Bromley’s Atlas of Philadelphia. Karen Guss, director of communications for L&I, said that agency Commissioner David Perri had spoken with the apartment project's Philadelphia general contractor, Vaughan Buckley, and a representative of the developer, New York-based 4125 Chestnut St. CRCP LLC. Perri conveyed "the city's expectation that human remains, if any, will be treated with respect and dignity," Guss said. "The response was that they understood and that their intention was to proceed accordingly." Permits for demolition and construction had already been issued by L&I. Whether an archaeologist will be allowed on site to determine if graves are present could not be determined Thursday. Buckley could not be reached for comment. The Rev. J. Wendell Mapson Jr., current pastor of Monumental Baptist, now at 50th and Locust Streets, said he was unaware that a cemetery associated with his church lay underneath the Chestnut Street car wash. But Mapson found the information alarming, he said, and planned to contact city officials. The land occupied by the graveyard was purchased by three men in 1826 from Peter Rose and his wife, Esther, for $105. At least two of the three purchasers were founding members of the African Baptist Church of Blockley, the precursor of Monumental Baptist. The earlier church was located 41st and Ludlow Streets until the mid-20th century. The men who bought the land at 4125 Chestnut made the purchase as trustees of the African Friends to Harmony, which apparently was a benevolent or mutual-aid association. They acquired the property just a few days after the land for the church at 41st and Ludlow was acquired in July 1826. Archaeologists point out that African Americans in Philadelphia often formed benevolent associations specifically for assistance with burials, which were rigidly segregated. For instance, Richard Allen, founder of Mother Bethel A.M.E. Church at Sixth and Lombard Streets, acquired land on Queen Street to provide African Americans of any denomination with decent cemetery plots. The Bethel Burial Ground, between Lawrence and Leithgow Streets, fell into disuse and then down the memory hole by the end of the 1860s. But it re-emerged when renovations to the playground above it were about to commence a few years ago. Construction stopped, archaeologists were called in, the burial ground was mapped, and the graveyard is now on the Philadelphia Register of Historic Places. "Burial was such a problem for African Americans that the first thing their benevolent societies did was provide for burial," said Jed Levin, a member of the archaeological forum. In 1885, nearly 60 years after buying the land at 4125 Chestnut from the Rose family, the three original purchasers conveyed it formally to the African Friends to Harmony. They had been holding the ground as trustees of the African Friends. A newspaper article characterized the site, in noting the conveyance, as "an old burying ground." The conveyance, for some reason, was not completed until 1910. "The property was owned by African Americans for an extended period," said Levin. "Make of it what you will. … To me, overwhelmingly, the most logical and most likely explanation is that this was a burial ground for use by the [benevolent] association."